Day 1 An easy start from Edinburgh or Glasgow. Today we take you to visit Blackness Castle – the 5th-century castle was a garrison fortress and state prison, it also stood in for Fort William in series one of Outlander. Learn about the Crichtons – for whom Blackness was built – one of Scotland’s most powerful families. We will also visit Linlithgow Palace; magnificent ruins of the birthplace of Mary Queen of Scots, built by the Stewart kings. Step inside the ruins of Mary Queen of Scots’ birthplace, enjoy views ofthe Forth bridges. 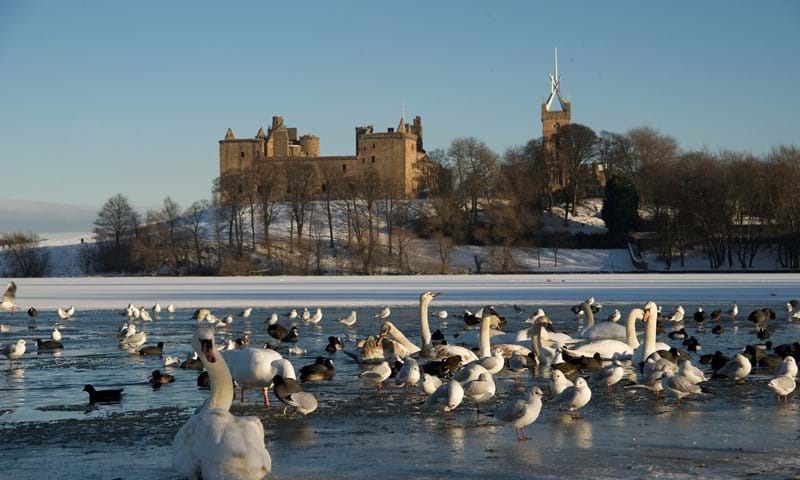 Linlithgow Palace stands in for the fictional Wentworth Prison in an episode of Outlander. You stay on the outskirts of Linlithgow, 20minutes west of Edinburgh in a wee cluster of whitewashed farm steadings. Champany Inn. Fine Scottish produce served in spectacular surroundings of their dining room or The Chop and Ale House, an informal dining experience served in the atmosphere of a lowland bothy. Rooms at Champany Rooms are elegant and hung with hunting tartan curtains. Day 2 We drive over the River Forth into The Kingdom of Fife to discover the beautiful village of Falkland host to 1940s Inverness in the series. The village is dominated by Falkland Palace. Inspired by the grand châteaux of France, in the 16th century James IV and his son, James V, transformed this retreat of the royal Stuarts. Mary, Queen of Scots was enchanted with the palace and enjoyed falconry, hunting and tennis, in what is now the oldest surviving real (or royal) tennis court in the world. We then drive to the village of Culross, with its 16th century buildings and Culross Palace, appearing in seasons 1 and 2. Its’ rooms, courtyard and gardens have been used to great effect in many scenes, first in season 1 when the palace gardens are used as the herb garden at Castle Leoch. We then see the palace Withdrawing Room doubling as Geillis Duncan’s parlour. In season two the courtyard and main stairway were used as the village encampment where Claire pulls a tooth from a local woman and Murtagh waits on Jamie meeting the Prince. The Palace High Hall was used for the Jacobite meeting where Jamie swears his oath to Prince Charlie. The Palace’s Kings Room was used as a bedroom when Jamie and Claire’s visit the village. The Palace’s Kitchen and Pantry was used as a tavern. We return to Linlithgow via the Kincardine on Forth which was the longest swing bridge in Europe. The bridge has not swung since 1988 and only small craft now go further upriver. For those wanting to explore Kincardine – an attractive village with history as a long standing trading port, is also home to Tulliallan Kirkyard, which has one of the best collections of old Scottish grave stones anywhere in the country. With ample free time at all locations, including time for lunch, we arrive back at Linlithgow for a final night. Day 3 To the Scottish Highlands this morning , an ideal stop on the Outlander trail is the Highland Folk Museum in Newtonmore, where period actors and carefully-restored buildings help bring a key part of Claire and Jamie’s story to life. Then Inverness, to the Battlefield of Culloden Moor, where the last battle on British soil occurred in 1746 – also featuring in Outlander. Nearby are Clava Cairns, a series of tombs and standing stones which pre-date Stonehenge by 1,000 years. This ancient, mysterious site was Diana Gabaldon’s inspiration for Craigh na Dun, Claire’s time portal. 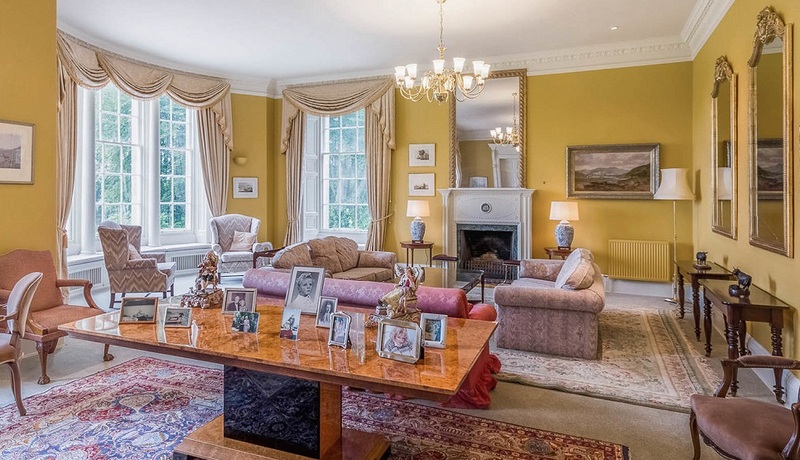 Spend the night in the wee village of Rafford, near Forres, at the superb Blervie House. Day 4 From Inverness to the ruins of Beauly Priory in nearby Beauly, the village is associated with Clan Fraser of Lovat from where Jamie descends. The priory itself is where Claire meets Maisri the Seer. With a wee detour from Outlander (or is it?) we drop by the Glen Ord Whisky Distillery to learn all about this art of whisky making and of course get to taste the beautiful liquid! We drive back to Inverness, you can enjoy free time here, before returning to Blervie House once again. Day 5 Driving south, down the A9 route, we stop at the wee town of Doune, to tour Doune Castle, featured in Outlander as “Castle Leoch”. The stunning castle plays a leading role substituting for the fictional Castle Leoch – home to Colum MacKenzie and his clan in the 18th century, also in the 20th century episode when Claire and Frank visit the castle in ruins on a day trip. From here to Hopetoun which stands in for the residence of the fictional Duke of Sandringham. Simon Callow plays the Duke, but the real owner is Adrian John Charles Hope, Marquess of Linlithgow. Dating from the 17th century, Hopetoun House was used as various roles in Outlander: The Duke of Sandringham’s stately home (S1), the spare room in Jamie and Claire’s Paris apartment (S2), the backdrop for Parisian streets (S2), the stables at Helwater and the exterior of Ellesmere (S3). We can also see Midhope Castle, a small castle that doubles as Jamie’s home, Lallybroch, in the series. However, it is now derelict and not safe to enter. The day – and your tour end in Edinburgh or Glasgow. From £1180 per person, based on a group of four guests. Can be for any number and requoted.